When did you decide to become and artist and why? I do not think there was ever a point where I decided to become an artist. I came from a very corporate family. My university years were spent in the business department. That said, I began making jewelry in the 6th grade when I started collecting old necklaces from garage sales and turning them into something I could give my friends. This continued until I took my first metals class when I was 16. I certainly caught the bug but never thought about it as an occupation. As a member of a big business family, art was not something you “did,” it was something you purchased. Why or how did you choose your medium? If you weren’t doing this work, what would you do? Could you talk a little about why you love what you do? Someone once said “if you have your own business, you get to pick which 24 hours a day you work.” I love what I do 99 days out of a hundred. I get to create beautiful things that people value and love. I decide which direction I want my collections to go and then decide how to bring that vision into three dimensional form. There was a time, when the economy first started to crash, when I was not sure I could keep things going. My husband stepped in to partner with me and we have built the business stronger than ever. Creativity is not only about the jewelry. You must have creativity in the invention, reinvention, and growth of the business as an entity. My husband showed me how to find joy in that. These days I also have three absolutely wonderful women who work with me. We are a good team and they make everything better. Most of my experimentation is done on days when I am completely alone, but I value this team greatly and appreciate their contributions to keeping my business moving forward. My work has changed greatly over the years. My original collections where much sharper / tougher when I was living in NY full time. Today there is more fluidity to my work. How have you changed as a consequence of your work? As my business grew in its success, I gained the confidence to become more playful and take more chances in my work. I knew my production work would continue to sell well and it freed me to begin experimenting again. What is the most challenging thing about working in your medium? Maintaining my focus. I have also designed jewelry lines for other companies. My ideas are endless and there are many times when I try to do too many things at once. As my business coach says, “just because you can design anything, does not mean you should.” This is a constant challenge for me. Who or what are your major influences? I never really know how to answer this question. When you’re an artist you are influenced by everything you see, taste, and feel. What didn’t you know about your career before you got started that you wish you did? The importance of customer service and follow through. In the beginning I just wanted to make pretty things and have someone buy and appreciate them. Even having attended business school, I had no idea how much “the business of the business” would require from me. Any words of wisdom for those starting out? Heheh. I have been teaching two day workshops on this exact topic for the last five years: You can get in touch with me (or HandMade in America) for more information. I was interested in art/craft as long as I can remember. My great uncle was a painter and I remember seeing his paintings in many of my relatives’ houses. At some point, I started drawing a lot and pretending to be an artist. I also remember driving through WNC at a young age and being in awe as we passed houses with beautiful quilts, pottery, and woodcarvings set out by the road for sale. I credit those memories for planting a seed that inspired me to become a maker. What would you say informs you work? Currently, I am working on a series of sculptures informed by old sayings associated with time. My interpretations of these phrases translate into a series of sculptural objects. Through my choices of imagery, each piece becomes a passage from a personal narrative. This work tends to referenc my cultural surroundings here in rural WNC. My functional line of work is influenced by the history of glass, other glass artists, and the natural world. Designing a piece used to involve lots of trial an error. Now that I don’t have as much free time I have to plan things out a little more. I usually start with some thoughts on the idea and sketches. Sometimes I will make a more detailed drawing before I start constructing a piece. I always leave room for the idea to evolve during the process. For the more functional work, a large part of the design comes out of the process. With this work I usually start with an Idea, make it, then try to make it better. This may involve altering a shape or changing a color pattern several times. Constantly filtering out unwanted elements of a design allows my work to continue evolving. When I started exploring three-dimensional work, I worked mainly in clay, wood, and metal. Some of this work had small elements of flameworked glass. This work was much larger in scale due to the materials and influences at the time. After moving around a few times, storage and transporting large heavy sculptures became an issue. As I got more involved in the glass community, glass became my main focus. I now have a line of functional glass and continue to make small-scale sculptures. 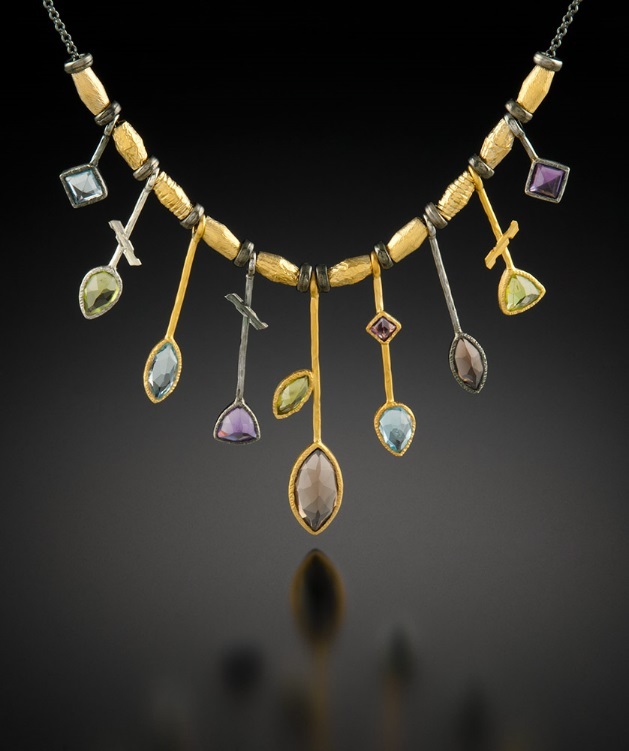 Like most mediums, the process of working with glass provides many life lessons. Working with glass is a humbling experience. It requires patience, persistence, and focus. It is common for hours or even days of work to crash to the floor for what seems like no reason. There are days when I wonder why I chose to work with such a fragile, unforgiving material. I’m still not sure if I chose glass or glass chose me. Over the years it seems like we have shaped and molded each other to the point where we have a somewhat of a symbiotic relationship. We don’t always get along, but we manage to make it work. I did a little bit of everything before being devoted to art/craft. It’s hard to imagine doing anything else. I do have concerns about the energy and resources that a glass studio requires. This is the main thing I question about my career choice. I guess if I had to change my occupation, I would like to do something that doesn’t add to our current environmental issues. I would like to think the positive aspects of arts/crafts counterbalance the negative impact it has on our resources. How is your work integrated with the community? 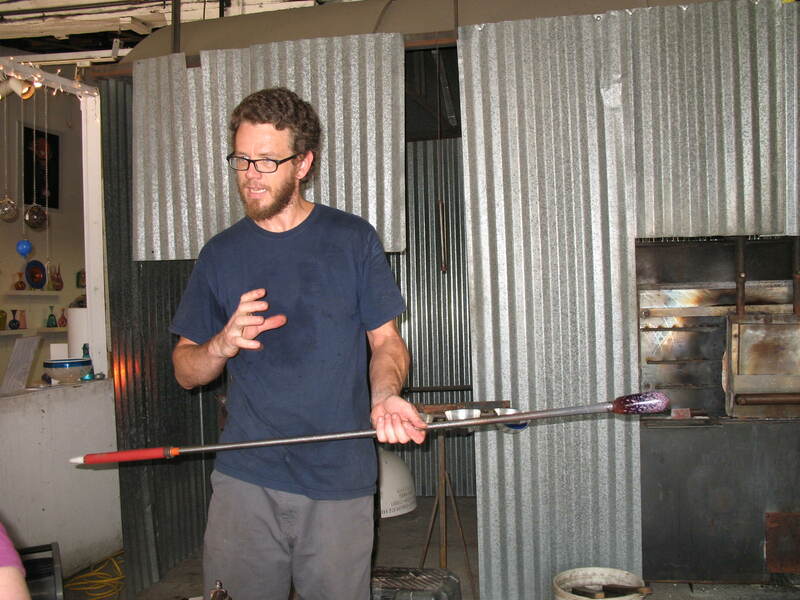 I try to stay involved with some public glass studios to teach classes and interact with the community. Continuing these traditional forms of art/craft defines part of the culture in our community. The void of these traditions is replaced with more destructive forms of consumerism. I like the thought of my functional works used in everyday life by our local patrons. The recent emergence of a local awareness has helped encouraged more support in the art/craft community. I hope that this idea grows and results in a more sustainable local economy. The inspiration for all of our creations from the very beginning has been the endless acts of creation of/by Mother Nature. Our first focus, in 1979 was extracting colors from the many dye plants of Western North Carolina. This extraction and the process of dyeing fibers and reeds opened our eyes to the hidden secrets within the natural world. Shape and color of course are apparent everywhere but to focus on the acts of creation itself have been our real inspiration. 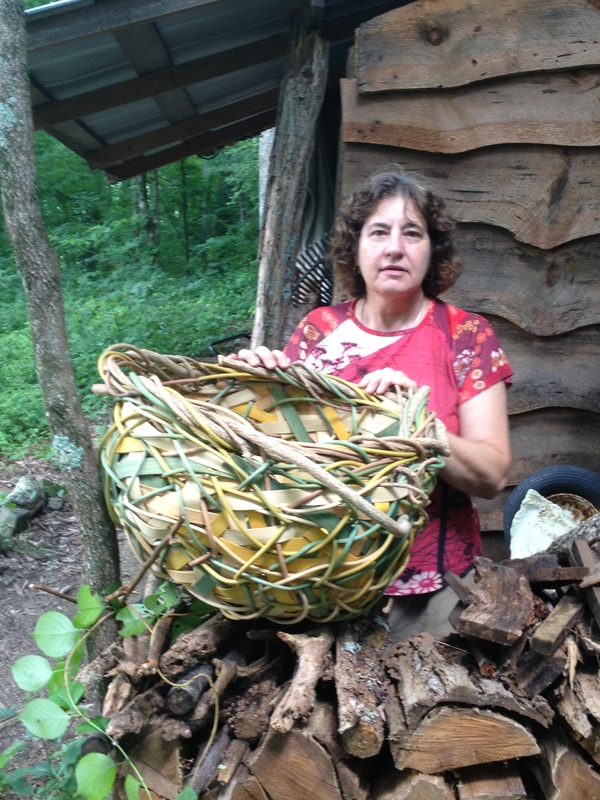 After many years of traditional Appalachian basketry and using patterns of all kinds, we discovered the weavers within nature. The animals that do not use easily recognizable patterns were our guides and teachers. We watched spiders and birds at work, particularly the weaver birds; we observed beavers weave their logs into dams and noticed the tiniest mouse nest was woven from soft, found materials. Suddenly we had become free from traditional patterns, and our work reflected this immediately and has never been the same. That’s when I developed the random weave style of weaving. Some of our shapes for the baskets were inspired by the traditional forms of Appalachian basketry other shapes came out of a more random process that the weave dictated. We really enjoy creating large wall sculptures for residences or corporate spaces. Working with clients about color, interiors, shapes etc is what informs us of what we want to design. Then a very left brain process takes place and we let the wild vines and reeds guide us to free flowing shapes and palettes that we feel will work with the design process. Custom colors and sizes are our specialty, and working closely with clients is how we achieve good results. Can you give me an example of something that inspired a particular piece of work? Much of our inspiration comes from the natural world. We were on vacation in British Columbia a few years back and spent time on the rocky beaches playing with the long lengths of bull kelp that flowed up on the shores making interesting shapes and designs in the sand.It washed up and held onto other surf side stuff. We got inspired to create a large sculptural wall piece that flowed over a long 16 foot wall as the entry wall of a newly built condo in downtown Asheville; 60 N Market Street. Working my whole life in craft and as a craft artist has given me the greatest gift; self employment. It has given me the freedom to work and play when inspired. Now I am able to give back to the craft community through mentoring and volunteering. We have worked with art consultants and designers who have gotten our work in several corporate and commercial establishments around the state and nation. We also had a stint as artists in the Arts in Embassies program which loaned our pieces to foreign countries and ambassadors’ homes. 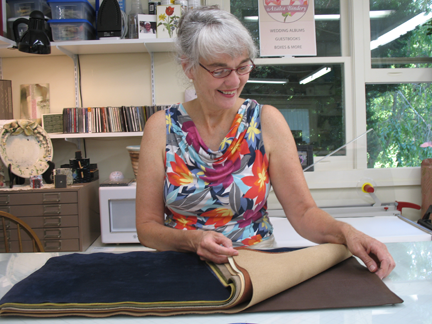 As members of the Southern Highland Guild since 1983, the craft community has always been an inspiration and resource as we grew into seasoned craft artists. What’s the most rewarding part about your work? 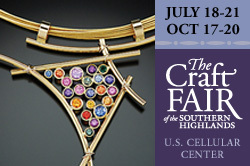 Craft Fair of Southern Highlands this week! I can speak for all of us at HandMade in America (HIA) when I say that we are very excited to represent at this year’s Craft Fair of Southern Highlands. For four days every July and October the US Cellular Center is packed full of fine crafts from over 200 craft artists, selling their works of clay, fiber, glass, metal, and more. Staff and volunteers of HandMade in America will be at a table to share our latest and greatest news, events, and programs. This will be our first time representing at the Craft Fair of Southern Highlands. Did you know that the Southern Highlands Craft Guild was chartered in 1930? The Guild was created in response to the Great Depression as a way to help craftspeople and generate revenue in the Appalachian regions. Fast forward 83 years, and the Guild is made up of almost 1,000 craftspeople from 293 counties, spanning 9 states! They keep busy with many different educational programs, demonstrations, an entire library, 5 craft shops, and 2 of the most highly recognized craft fairs held every year. 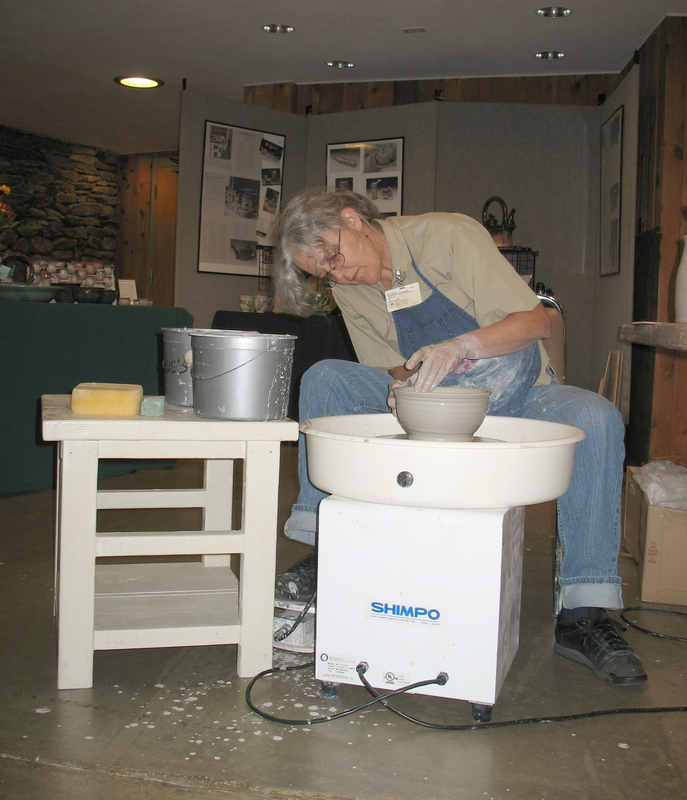 The first Craft Fair of Southern Highlands was in 1948 in Gatlinburg, TN. It wasn’t until a few years later, in 1951 that they moved the Fair to Asheville, NC. Back in those days the Fair was a full week-long event that lasted until 10:00 pm every night! It’s hard to believe that people would’ve been more serious about craft 60 years ago than they are today. Deb Schillo, Southern Highlands Craft Guild Archivist, explained that back in those days there would be people in lines extending far beyond of the doors to the Fair. That was one reason the Guild added a second craft fair in the fall of 1960. They have been offering two craft fairs per year ever since. Looking for something fun to do July 18th-21st? Come down this week to US Cellular Center in Asheville, NC to see craft artistry represent this amazing Southern Highland region that is so rich in craft and culture. Oh, and say hi to us at HandMade in America too! 1. Why or how did you choose your medium? A few years after college, I wanted to start a small, part-time, creative business (we had 2 small children). 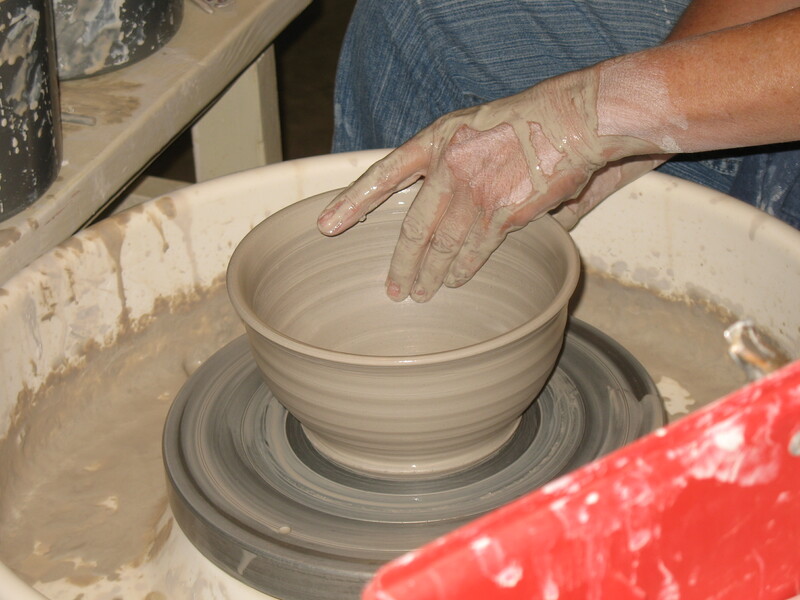 I had taken a couple ceramics classes as an undergrad and loved working with clay—especially throwing. I had an opportunity to work out of a private studio in Columbia, SC with a potter named Mary Ann Wardlaw—so rather than painting (my original background), I started a pottery business. The flexibility worked well around family needs. CLAY CLAY CLAY It’s really all about that. 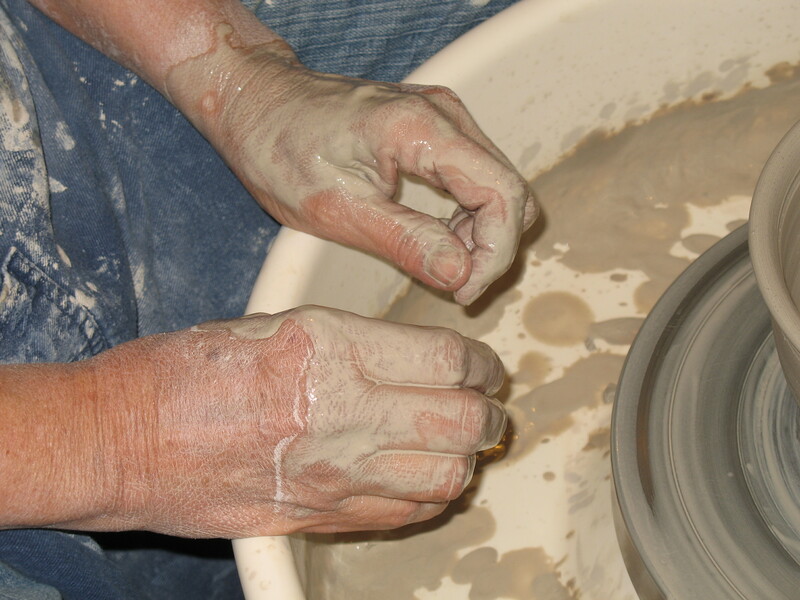 Working with clay is very ‘process oriented’—that’s the attraction. I work primarily from wheel-thrown components. I’m only half teasing when I say that the clay keeps a person ‘centered’. Beyond throwing, as mesmerizing and meditative as that can be, there is the quality of mark making and creation of form. Having worked with clay for over 20 years, I have a decided interest in the problem solving inovlved with making complex forms or pieces. What fun to test one’s skills against this ornery & willful material. Beyond the creation of interesting clay pieces is the challenge of glazing and firing the work to best advantage. I have enjoyed working in a variety of firing types: oxidation, reduction, soda and wood fired. Each of these offers a unique surface for a ceramic artists’ use. 3. Do you have any other creative pursuits? I always thought I would be a painter—I even had 3 yrs towards a BA in Painting. I don’t paint very often now, but a fun project I’ve done the past 2 years is take part in the Potter’s Pallette, a fundraiser for the NC Pottery Center in Seagrove. I also love printmaking (I did quite a bit in grad school). The past 2 yrs, I’ve been learning Ikebana (the art of Japanese flower arranging). Most recently, I have taken some classes to make needle-sculpted dolls. 4. How long have you been working in your medium? I set up my clay studio in 1984. From 2002-2004, I attended Graduate School at Clemson University (MFA Ceramics) and taught there part-time for the next 6 yrs. Back to full-time studio in mid-2010 here in Asheville. 5. What would you say informs you work? As an artist, my work has grown to embrace the vessel through my previous involvement and understanding of more traditional functional pottery forms. I maintain a desire to make the work “functional”, yet the definition of function has evolved to embrace the utilitarian as well as the intellectual or conceptual aspects of the term. The clay vessel used with the idea of embodied learning has allowed layers of information to be included in these pieces. Ideas that keep recurring in my work involve the passage of time. At one point, the idea of time passing in front of me – and now moving to a broader revelation of how I am moving in time-based phases – as are we all. I enjoy the use of the ceramic vessel in this exploration for the range of forms, the associations and metaphorical uses they have and the ability to take advantage of ceramic processes (mark making, glazing, firing, etc). 6. Who or what are your major influences? Some influential clay artists include—in no particular order —Betty Woodman, Peter Voulkos, David Shaner, Byron Temple, Ron Meyers, Bruce Cochran, James Lawton. Other artists who inform my thinking on art include Mark Rothko, Andy Goldsworthy, Antonio Gaudi, Martin Puryear, and of course Dr. Seuss. 7. What is the most challenging thing about working in your medium? 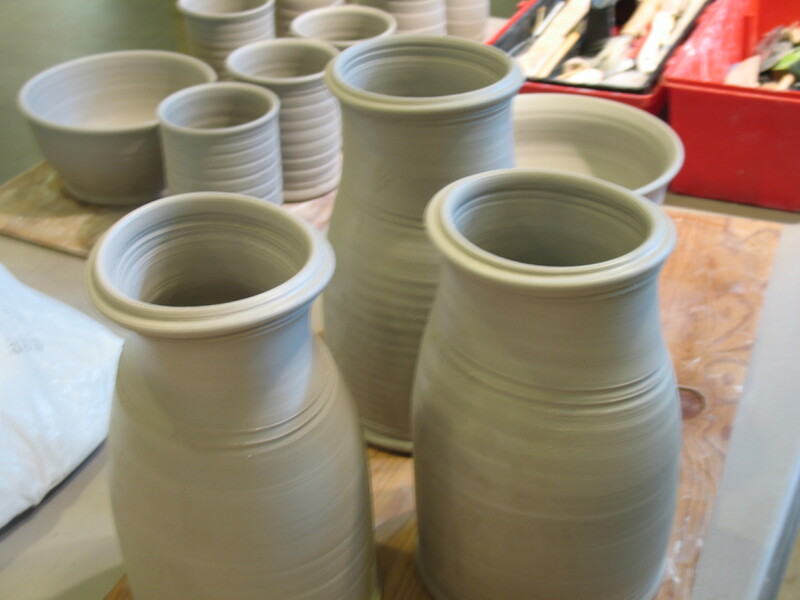 Clay has opportunity to fail in at least 3 different ways beyond the ‘idea’ stage: while working with the wet mud, during the drying & bisque firing, and during the glazing & glaze firing. There are technical & creative decisions in tackling each of these areas and succeeding. 8. Any words of wisdom for those starting out? Be prepared to put in your time to get really familiar with your medium. Become an ‘outlier’ (think of Malcolm Gladwell’s book Outliers). And dig deep for your own voice. Explore your influences & inspirations, traditional & contemporary sources. What will set you apart will be your unique experiences/interpretations layered into your creative work. 9. When did you decide to become an artist and why? My parents started getting me drawing & painting lessons when I was in 6th grade. Thanks Mom & Dad! I also had a very wonderful art teacher in Junior High School. I never thought of doing anything else but art. It was a surprise, looking back, that it has been as a ceramic artist rather than as a painter. 10. What’s your design process like? In the years since my MFA, I have been more interested in how/where the work I choose to make will be placed/used. For example, one of my favorite pieces was designed to ‘fit down the middle of a long dining table in a spacious room. I knew the piece needed to be of a certain scale to succeed. The resulting piece was a long & low fluid footed vessel. When actually working on the piece, I don’t start with drawings, rather I work directly with the clay—problem solving as I go. When did you decide to become an artist and why? I always wanted to be an artist, however, my brother, Greg, was the artist in our family. I watched him for a long time believing I didn’t have the gift. Later in life, I started exploring decorative paper arts, creative journaling, and took an occasional drawing class. When I had time on my hands, I got serious about art work and started studying basic color theory, drawing, calligraphy, marbling and book making. I took my first book binding class from a close friend. Her enthusiasm for the craft made me take another class. I loved the materials and the feel of a book in my hands. I was very interested in the skills required for book making. I joined a wider group of friends who were interested in starting a bindery. Things took off from there. Books are beautiful and useful. A book has to move, it has to stay together. After mastering the technical skills, the creative process can be applied in endless ways. Binding also involves sewing and I love fashion. 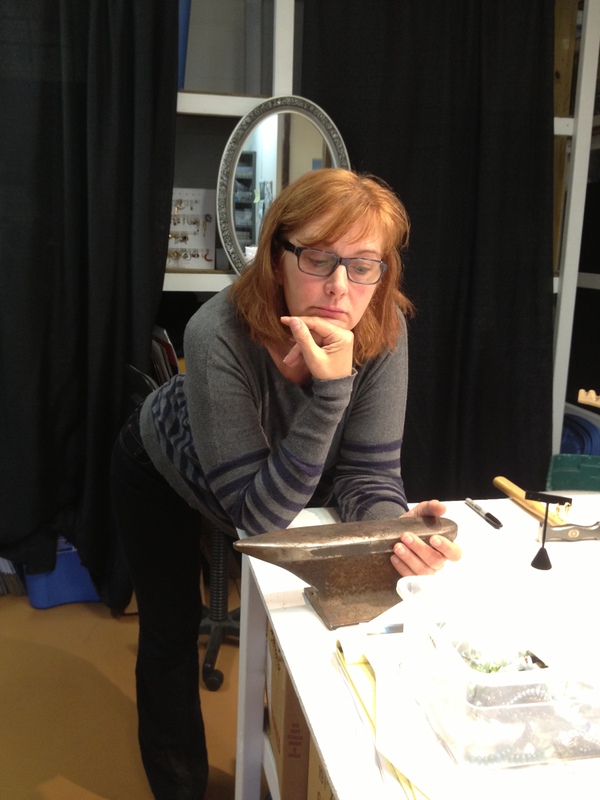 What is it about your work that brings you into the studio every day? I like being around all the tools, tables, cutters and bolts of book cloth and, of course, I enjoy making books. After working out a design, I begin to make measurements, cut the board, the cover material, and the decorative end sheets. I like the quiet, steady engagement which is built into something handmade. I’ve been working as a book artist for over a decade. I saw a vine with dark green leaves and an opalescent blue berry. I wouldn’t have thought to combine these colors but they were lovely together. I passed a black walnut tree losing its leaves in the fall. At a point, all that was left hanging from the linear branches were round blackened walnuts. The shapes translated into a printed design. Does the region inspire your work? Yes, very much so. I grew up and went to college in the northern Appalachians and now live in the southern Appalachians. A career in forestry put me in the woods for many years. There, I learned to observe and notice the subtle things, like color differences in the bark of trees, grays, brown, even silver and copper. I recently completed the Report Card on Forest Sustainability in Western North Carolina which led me to an even greater understanding of the history and culture of Western North Carolina. I remain interested in our region’s natural, cultural and economic resources. I have changed as a result of being a professional artist. I’ve learned that creativity takes time. You can’t plan it or compartmentalize it like many things we do in life. You have to approach it from the side not directly. What is the path to growing as an artist? For me, it is fundamentally about trying to do my best and hoping others take pleasure from my view of things. Equally important is working from my intuition rather than my intellect. This helps me grow as an individual and an artist. The pieces I make are used to strengthen memories and are a vehicle to better knowing ourselves. They are meant to be filled with pictures and thoughts and shared with others. Through my work, my own participation in the community has broadened. I have an even greater appreciation for all things handmade and what a commitment that is. I see the community as having a high talent quotient, much of it available to all. Patience versus speed. It’s always a challenge. Learn well and expand your influence. Purchase your CSA share today! 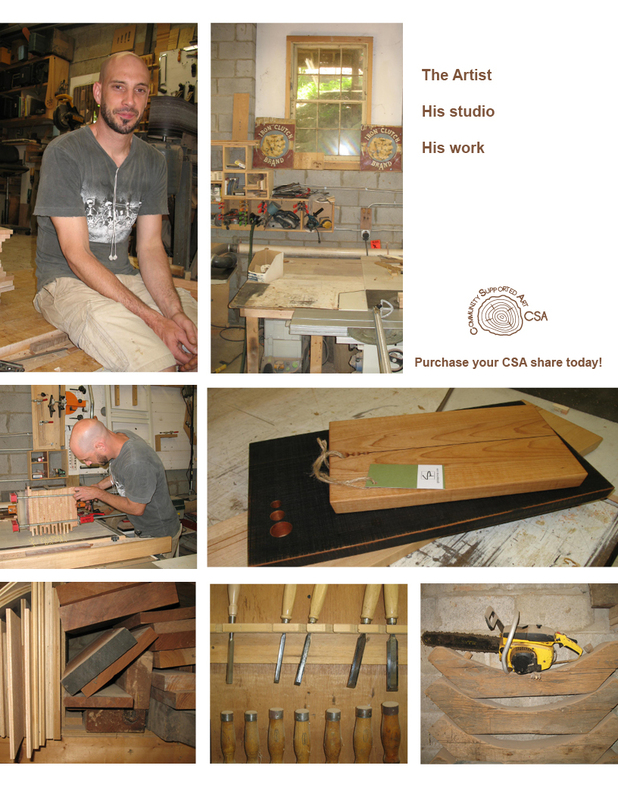 In conjunction with our inaugural CSA program, Handmade in America has started it’s “Conversations with Artists” series. Follow our blog to learn more about this year’s CSA artists: where they work, who they are, and what inspires them. I’ve always made things with my hands. Its always felt like something I had to do as opposed to a choice. I crept into wood via working as a delivery guy for an interior design shop and furniture store. Ironically, I come from a woodworking family but didn’t arrive at wood through them. I was also born in High Point, historically, the furniture capital of the world. I feel most natural when I make things by hand. Sometimes its more creative than others. There is certainly a sweet spot when something that’s creatively engaging intersects with a manual challenge and the two marry successfully. Especially when that effort ﬁnds some value in the world outside my shop and I can introduce something, even a small thing, to the human experience that is completely new; an object to interact with that has never exactly been seen before. The quest for the sweet spot referenced in the answer above. Also, bills to pay. I cobbled together little soap box derby/jalopy-ish kinda thing from twisted scrap wood to ride down the hill in my neighborhood when I was in the 3rd grade. So, almost 20 years. What would you say informs you work? Regarding functional woodwork: the needs of the end user, ergonomics, decently intelligent design, and cost effectiveness. In work that’s less than strictly functional, irony. Usually dark irony. Who or what are your major inﬂuences? 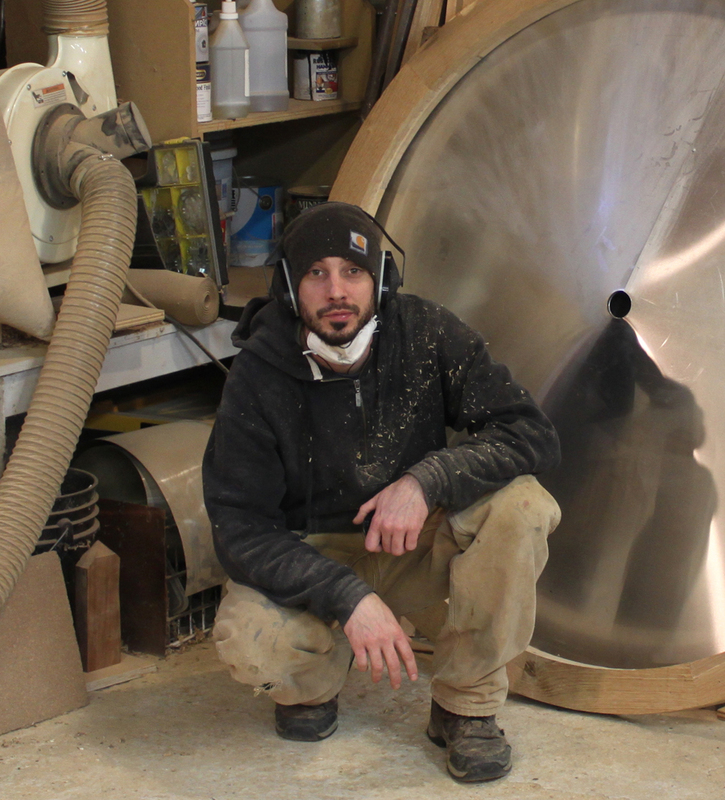 NC-based wood sculptor Bob Trotman as well as scores of other top-tier local woodworkers, Russian graphic artist Alexander Rodchenko, Joseph Beuys, Danish design, historic culinary objects, my own family history and many other things. If I work on a commission, I sit with a client and we go step-by-step through needs, options, problems, solutions, tastes, and budget. If I work on something for myself, I have a place I think I want to go creatively, then I try to get there through the maze of my own creative exploration. Inevitably I hit walls, rework my strategy, the work piece, the end goal, etc. and try again. I like prompts. I like having someone setting some parameters for me or I can spin in creative circles, seeing too many options. Once I built a piece from wood recycled from a table that belonged to the clients late grandfather in the 1940’s. The new piece was actually going to serve as a small stand to hold a steamer chest that had traveled the world during the 1920’s with a late great-grandmother. A “Day-of-the-Dead” theme developed with-in the piece leading to carved imagery and icons that lamented and celebrated our own mortality. It was an unexpected place I arrived that wouldn’t have been possible without the very premise of working with the ancestral material. How do you choose your color palettes/materials? I prefer simple, understated colors, neutrals and contrast. 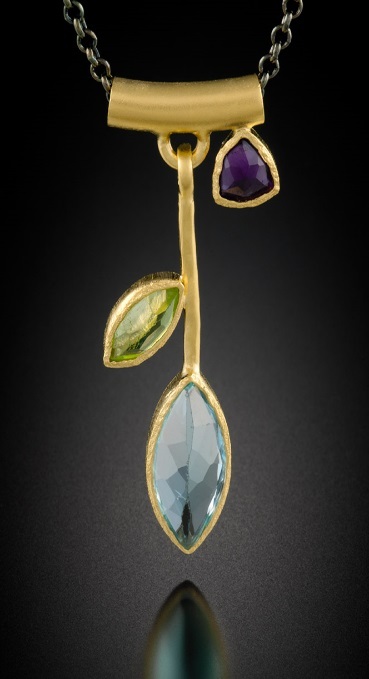 Outside of the other makers who are here, I think the region is inherent in my work. I can’t help being inﬂuenced by my surroundings. I think I generally, actively, look for inspiration outside the region. In some ways. I’m learning to appreciate smaller things. I’m learning to say more with fewer expressions…..I hope.